Born in Ferrara, Costa became known within the Bolognese School of painting, but also within the School of Ferrara painters. Both Schools of painting have strong ties with several artists considered active within both styles. 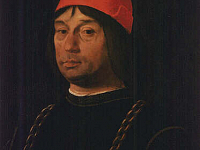 It is mentioned that Costa trained with one of the founders of the Ferrara School, Cosimo Tura (1430 – 1495). From Ferrara, Costa traveled to Bologna, where he befriended the painter, Francia (1450 – 1517) and then traveled on to the city of Mantua. His was a collaborator with Francia, also with other important Ferrarese painters such as Cosimo Tura (1430 – 1495), as well as Dosso Dossi (1490 – 1542) and Ludovico Mazzolino (1480 – 1528), both of whom he trained. The Bentivoglio family was prominent in Bologna, but was expelled to Ferrara by Pope Julius II (1443 – 1513) under the invasion of King Louis XII (1462 -1515) of France. Costa did not follow his troubled patron and instead left for Mantua by invitation from the city’s ruler, Francesco II Gonzaga (1466 – 1519). 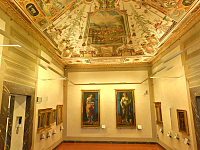 Costa found a gainful position as court painter there, succeeding the great Andrea Mantegna (1431 – 1506). 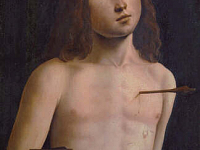 Costa’s other painting in the Uffizi Gallery is his depiction of, Saint Sebastian, a work of noted controversy. It is claimed to be a work of substantial beauty from the Northern Italian painters, where other critics find it to be an average depiction, unimpressed by the Sebastian’s facial expression. Though, most critics agree that the work is an undeniable accomplishment in its beauty of form, (Kren and Marx, Web Gallery of Art). Costa’s sons, Ippolito and Girolamo were both painters as well, as was Girolamo’s son, Lorenzo the younger.